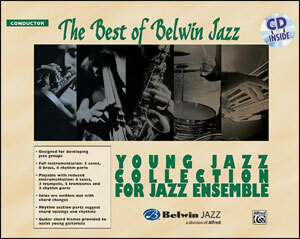 The Best of Belwin Jazz: Young Jazz Collection includes twelve outstanding jazz arrangements for the young ensemble. Each chart is written by experienced educational jazz arrangers and composers in a variety of styles and tempos: swing, ballad, holiday, rock, Latin and pop. The collection is written for full instrumentation, but can accommodate reduced instrumentation of four saxes, three trumpets, two trombones and three rhythm. Additional optional parts are available for flute, clarinet, horn in F, baritone horn T.C./tenor sax and tuba. The rhythm section parts offer suggestions for rhythms, piano chord voicings and guitar chord frames. All solos are written-out in improvised sections. The conductorï¿½s book includes full-length CD recordings of all titles. Best of Belwin Jazz: Young Jazz Collection for Jazz Ensemble - 1st Baritone T.C. Best of Belwin Jazz: Young Jazz Collection for Jazz Ensemble - 2nd Baritone T.C.